Journal of Construction Engineering and Management, Volume 141, Issue 1 (January 2015). Multicriteria decision-making (MCDM) methods can help designers address the choosing problem in building detailed design. Many, however, appear to assume that all methods are equivalent. This paper argues that differences between MCDM methods matter. The first contribution of this paper is differentiating between the analytical hierarchy process (AHP) and choosing by advantages (CBA) by comparing them through an example. The second contribution is explaining why CBA is superior to AHP for this context. In summary, CBA (1) provides a more context-based analysis than AHP, (2) does not incorporate conflicting judgments for weighing factors as AHP does, (3) does not assume linear trade-offs between factors as AHP does, (4) does not assume that factors have zero as a natural scale as AHP does, (5) focuses on differentiating between alternatives more than AHP, (6) maintains the result of the decision when nondifferentiating factors are removed, whereas AHP may not, and (7) defers subjective judgments until late in the decision-making process, whereas AHP requires expressing them earlier. This presents a significant research finding, considering the wide use of AHP. Further research is needed to assess what range of design decisions CBA supports. Most practitioners in the architecture, engineering, and construction (AEC) industry lack of decision-making training. More over, most practitioners do not realize the high impact that decision-making methods have on their decisions. This paper recommends the use of Choosing By Advantages (CBA), an innovative decision-making method that helps make more transparent and consistent group decisions than traditional methods, such as Analytical Hierarchy Process (AHP), for the detail design problem. 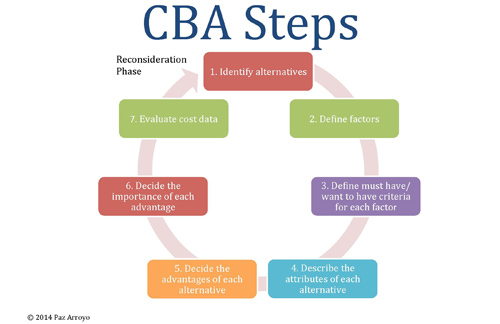 The main difference of CBA with other decision-making methods is that CBA requires decision-makers to agree on the differences between the alternatives first and then judge the value of those differences. Other traditional methods require decision-makers to agree on general judgment, such which factor is more important, which may be more conflicting and also may generate inconsistencies in the decision. CBA has a great potential for applications in many other fields of engineering and management where transparent and collaborative group decisions are needed. Currently Dr. Arroyo is developing further research running experiments to test CBA consistency in-group decisions against other traditional methods such as AHP, and Weighted Sum (WS) in the Catholic University of Chile. In addition, Dr. Arroyo developed a software that follows CBA logic in other to test the method in a broader arena. For more info see: www.paramountdecisions.com.